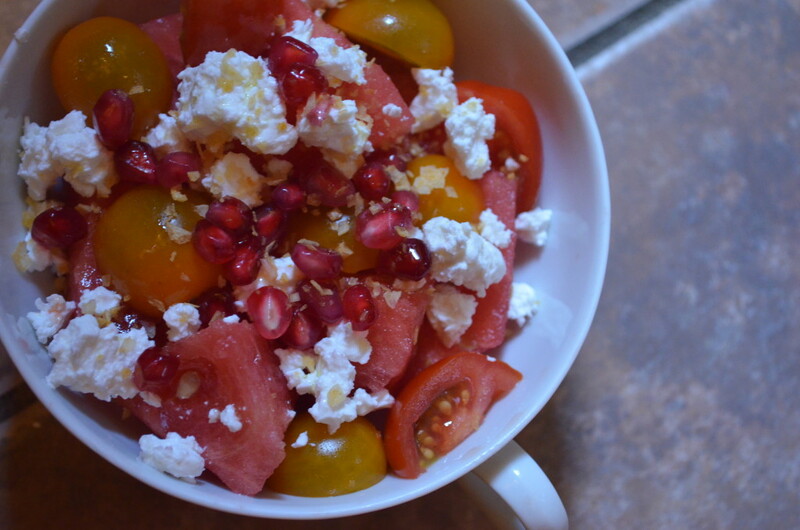 The summer I was living in Israel, I ate watermelon sprinkled with tangy, Bulgarian Feta cheese every day. The refreshing summertime combination is a salty, sweet, healthy and re-fueling snack. The dish sometimes gets spiced up with Zaatar, mint, special olive oils, seeds and more. 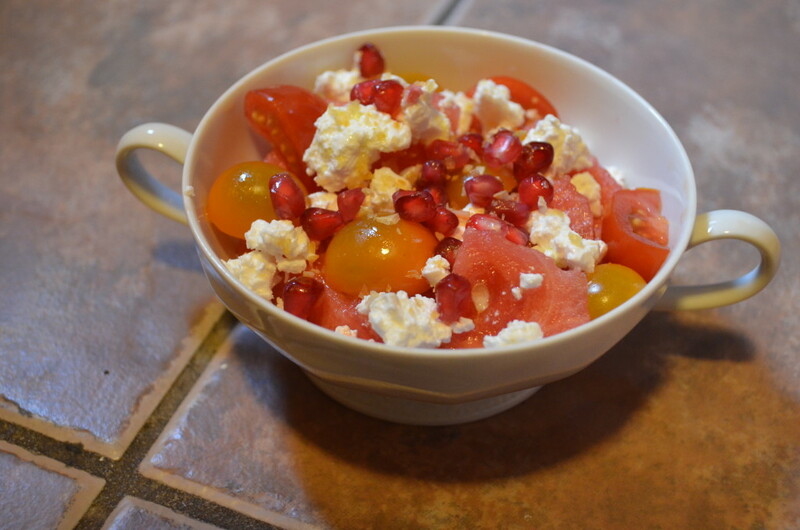 However, the base of feta and watermelon remains the same. In the USA, particularly in NYC, I find myself a bit more beholden to the whims of a seasonal market. We do not have (fresh) watermelon year round – our peak season is May through September. The savory super-fruit, Pomegranate (which also has roots in the Middle East), tends to have a harvest season that extends from October until December. Pining for the warmth of the summer months, and craving a cuisine based in desert terrain, I found myself at a cross-roads between time-of-year and availability of produce. Therefore, I bring you the End of Summer Salad – a mix of middle eastern loves, autumn output, and Mediterranean influences. Bon Appétit OR as they say in Israel – (be’te-avon) בתיאבון! 1. The Tiniest Cave Bear Necklace in Solid Bronze by Moon Raven Designs – Etsy. This tiny 3D cave bear necklace is a mere 7/8″ tall from head to toe. This little bruin is cast in solid jewelers bronze with remarkable detail for such a small specimen, he displays excellent hair detail and you can even see his little bear behind. He hangs in a natural standing position from a 24″ black gunmetal curb chain, ready to protect you with tooth and nail. The cave bear was a species of bear that only lived in Europe during the Pleistocene and became extinct at the beginning of the last ice age about 27,500 years ago. 2. Can’t Bear to Leave Sweater – Modcloth. Imagine yourself sipping hot cocoa, in a log cabin, warming yourself near the cedar fireplace. Vermont maple syrup included. 3. Teddy Bear Pillow Aqua – Thomaspaul. 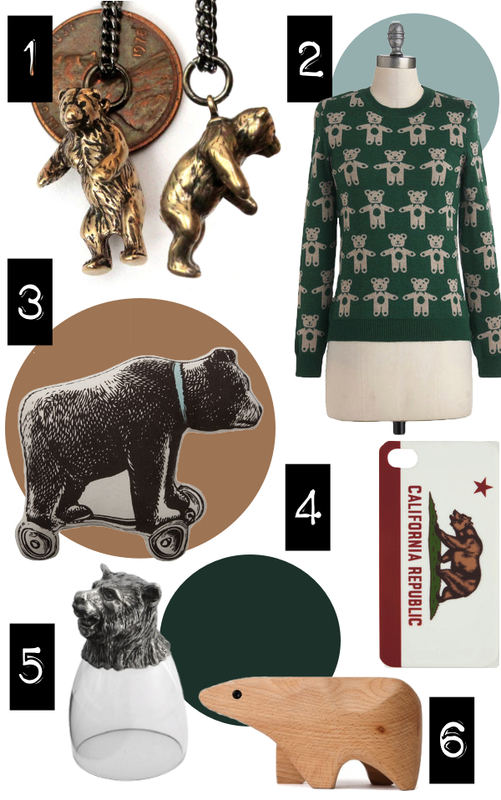 What could be more decorative than a circus bear on skateboard wheels in whimsical illustrative prints? Thomas Paul was born and raised in New York City. He got his start in the fashion business working as an intern at DKNY in the mid-nineties after, graduating from New York’s Fashion Institute of Technology with a degree in Textile Design. Paul’s pillow collection utilized silk printing mill’s capabilities! 4. California Bear iPhone Case – Tilly’s. The Bear Flag is the official flag of the state of California. The precursor of the flag was first flown during the 1846 Bear Flag Revolt and was also known as the Bear Flag. The Bear Flag represents the period of revolt against Mexico initially proclaimed by a handful of American settlers in the Mexican territory of Alta California on June 14, 1846, in Sonoma. History alert: The original Bear Flag of the California Republics was destroyed in the fires following the 1906 San Francisco earthquake. 5. Animale Bear Liqueur Glass- Arteltalica. Sophisticated whimsy is perfectly portrayed in this Animale glass, which was inspired by pewter cups used to celebrate the hunt in ages passed. The base features an animal which stands proudly while not in use and sits securely to hold a favorite cocktail. Italian glass and pewter. Handmade in Italy. 6. Polar Bear Box by Karl Zahn – Aha Life. This Beech wood polar bear-shaped box is made with sustainably harvested, new growth wood. Karl Zahn is a freelance product designer hailing from Brooklyn, New York. The founder of Boiler Design Office, Zahn’s designs feature delightful touches for the curious modernist, honest materials and construction, and unfussy yet thoughtful conceptual execution. Celebrate the smooth natural shapes of animals and plants by coexisting peacefully with this totem. 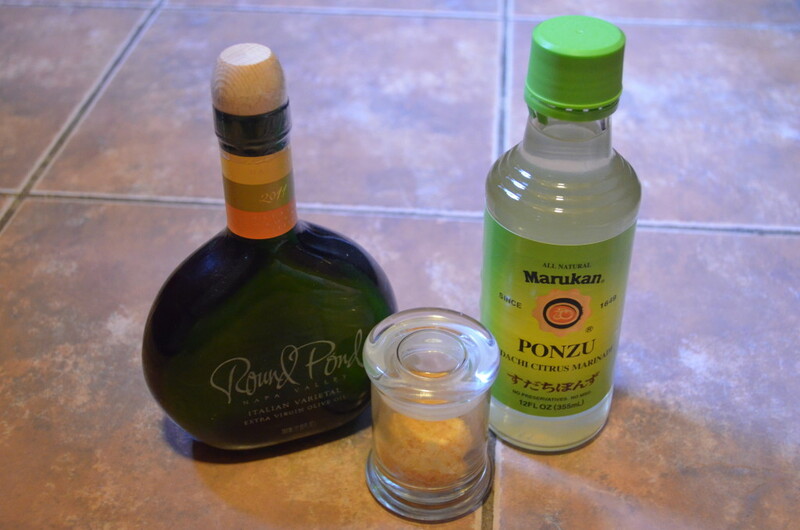 If you prefer your animals edible but cannot BEAR to eat a real bear, try this recipe instead. 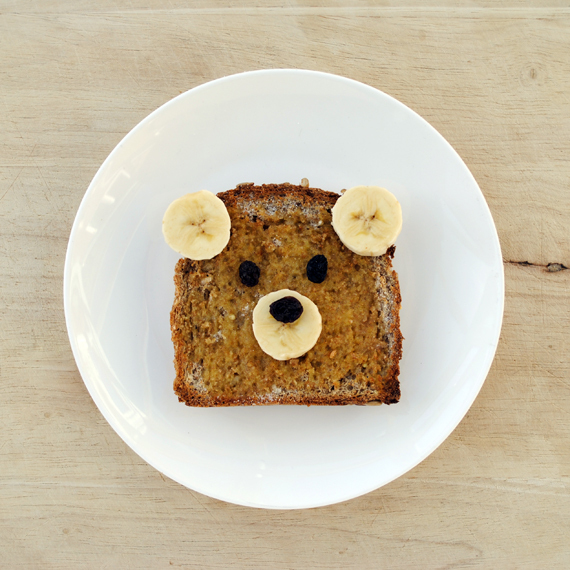 All you need to make this sweet teddy bear toast breakfast is bread, bananas, raisins, butter, cinnamon and sugar. If you’re alone and the window’s curtains are drawn, I give you full permission to eat this delicious Sunday morning snack while completely BARE.